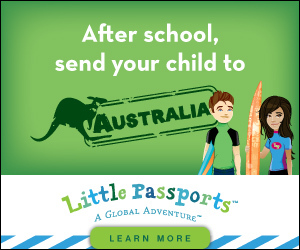 I will receive this product for free from Little Passports for review. This post contains affiliate links. So, I've been looking for some unique but special gifts for my girls and I have found TWO that I'd like to share with you. And not only am I letting you know about them, I have AWESOME Black Friday deals for you too! I stumbled on this awesome site a few weeks ago, and am anxiously awaiting the arrival of our first suitcase. This is an awesome gift that you can give your child, the gift of learning about the world, and I'm not talking about buying a globe. Check out these BLACK FRIDAY-CYBER MONDAY DEALS!!! Seriously?! I love that this is fun, educational and exciting for my girls! Wouldn't your kids love it too? Check out this BLACK FRIDAY DEAL too!